He's so smart he can recite the periodic table of elements and name how many electrons are in each! 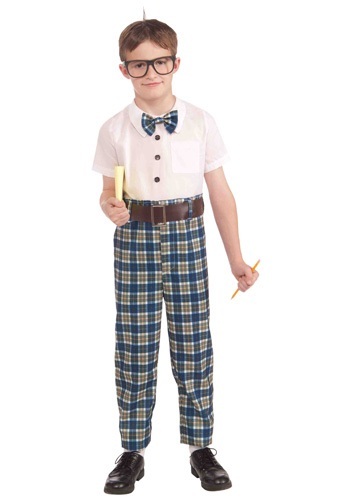 This Child Class Nerd Costume consists of a one piece jumpsuit with attached bow -tie. 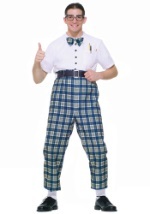 The bow-tie matches the plaid pant legs of the jumpsuit. The plaid is a mixture of green, blue, orange, and off white. 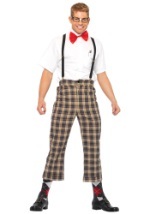 The top of the jumpsuit is a white collared short sleeve shirt with faux black buttons. The jumpsuit is fastened by velcro buttons in the back. The soft brown belt with silver buckle fits perfectly in the belt loops on the jumpsuit. 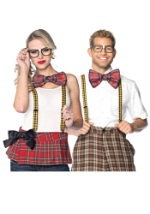 Accessorize this nerd costume with some black frame glasses!